I asked myself, “Harrington, DE, in the middle of August…. can I get there?” And as it turns out, I was fortunate enough to be able to. 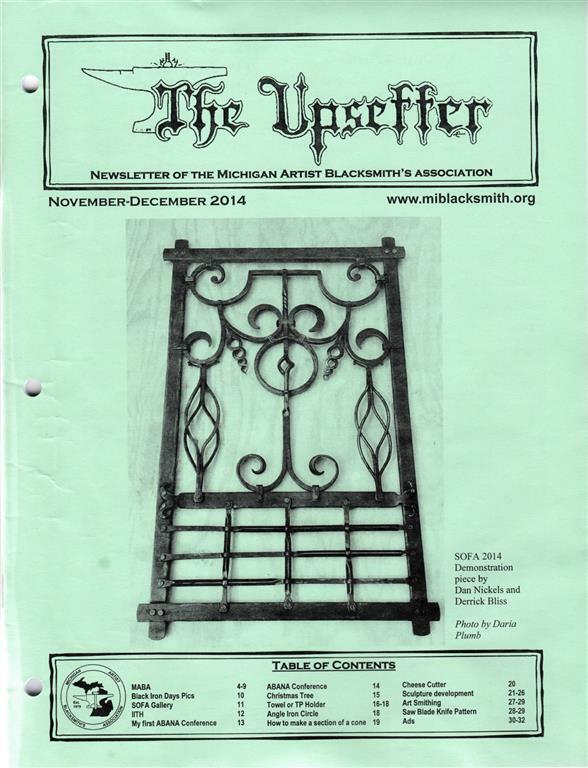 I’ve been an ABANA member for several years and always enjoyed everything I’ve been able to read about the blacksmiths and association. I’ve wanted to attend an ABANA event and with the encouragement from another member, it seemed like there was no reason not to attend the 2014 event held August 13th to 16th, in Harington, Delaware. The theme of this years event was “Making Connections” and I was overwhelmed with the success it held for me personally. My chaperone had attended many ABANA events prior to this one and served to teach me much about attending an event of this caliber. They also introduced me to so many other smiths and help me to begin new friendships with other ABANA members, very much in sync with forging connections! The event included a stellar line up of demonstrators and smiths. Choosing which tents to learn new techniques at was difficult. There are so many things going on at the same time, and so much information to retain, it was an adrenaline rush. The positive energy to be able to create and build anything is motivating to me. I marveled at all that was available to me to witness and was excited about taking the information home with me to try in my own forge. I used the program book to help guild me and also the input from other more seasoned smiths to influence me on how to get the most out of the event. ABANA’s program book gave great detail to each of the demonstrators background the projects that they would be working on and giving instruction about. This helped me to prioritize which times I wanted to be in which areas. Each of the demonstration tents were well assembled, with ample seating to enjoy the presentations. The presenters were all very easy to hear and willing to answer questions from all levels of skill. I have to admit, my attention bounced about. .. trying to experience a bit of everything. The segments presented through slide shows, showing the personal work and descriptions of techniques were highlights for me. I really enjoyed hearing the artists talk about where their inspiration came from and how it influenced the work they produced. The gallery was such a joy to walk through. Looking at the work and creativity of those submitting their pieces was not only an inspiration, but also a place to gage my own abilities and set new goals for my own work. The gallery was a great social area as was the tailgating area where there were many opportunities to buy tools and wares and learn more about things I know nothing about. Every area of the event offered something to benefit from. There was a raffle and an auction and all the good stuff that every successful event incorporates. The weather was wonderful. The people were wonderful. The worst part is that now I have to wait for the next event to do it all again, I’m marking my calendar now for Salt Lake City, UT in 2016. See ya there!